taken in Kota Tinggi. The whole unit were captured by the Japanese and most of them worked on the Thailand-Burma Railroad. More than a third of them died. In England Captain Baker’s wife, Phyllis, kept in touch with the mothers, wives and grandparents of the men. They wrote to her and there are hundreds of these letters. Some of them will be in a book about the survival of relationships between the relatives in England and Prisoners of War in the Far East. Anyone who thinks they might be related to any of the men in 27 Line Section is welcome to get in touch. For a full list go to 27 Line Section. Surviving the Death Railway: A POW’s Memoir and Letters from Home was publishing by Pen and Sword In 2016. I am sure it will be written. That’s the picture I love. So many people know so little about this part of the war. Hope you get some replies. Since 2010 I have found relatives of six of the men – mostly via the internet. The son of one of the men lives 8 miles from me and his son was in the same class as my daughter! I like that quote from Winston Churchill. Have you read my post about Eugene Gagnon’s Navigator? Hi Hilary, I am just watching the film “Women of Valour” on BBC catch-up and it made me think of your blog. The conditions that the prisoners had to endure look horrific and I don’t know how the men and women survived. It is astonishing what humans can cope with. We are the lucky generations, inheriting a more peaceful world, even if it doesn’t seem like that at the moment. What a touching post and a tribute to the men who endured horrific treatment. Thank you for visiting. Yes, these men should be remembered, I only wish the world were not creating such histories continuously. I knew your father when I was a pupil at King’s College Taunton from 1968 to 1973, I think he left in the summer of 1971. He was very involved in shooting, and I shot for the school for 5 years. He was a wonderful man, and it was a great pleasure to have known him, a proper school master. We were always doing something with guns whether it was .22, .303, or clay pigeons. I still remember very vividly going over to his house one day when he took us into his wonderful cellar / rifle range to shoot, he instilled some much enthusiasm in those interested in shooting, a love for which I still have today some 50 years later. I well remember him lending me a martini action .22 rifle one Easter holidays, and I spent the whole holiday going around shooting rabbits etc, would not happen today!!! There is a lovely photo of him in one of my old school magazines when he left in 1971. The internet can be a wonderful aid to discovery and while browsing I came across your late Father’s memoir “Surviving The Death Railway” edited by yourself. Please can you let me know if I can obtain a copy to read? We knew at school that he had been a POW in the Far East but nothing more, and at that age you just don’t ask questions. Sorry to have rattled on, but it just brought back some wonderful memories of my childhood school days, and a great schoolmaster. Thank you so much for getting in touch with me. I love to hear memories of my father and will share this with my brothers. Barry continued shooting (and winning) up to the last year of his life – 2009 and we had the launch of Surviving the Death Railway at Dipford House. Sadly, my brother and sister-in-law sold the house early in 2018, so we have to make do with memories now. I don’t know if you saw the comments from Tony Lamsdale further down this thread. He also found great interest in shooting via Barry when he was just a lad in the 1970s/80s. Yes, it is easy to obtain a copy of the Surviving the Death Railway. It is available on Amazon or directly from the publishers, Pen & Sword. I also have some copies for sale (£15 +P&P) if you email threadgoldpressATgmailDOTcom. If you just want to read a copy, the Taunton library has one. I recently read “Unbroken”. What an eye opener to the things that men endured. My dad refused to talk about the war. He didn’t want us to know the details. The book made me cry, it made me angry, it made me understand… Thank you for your tribute to our fathers. Thank you for leading me to Unbroken, I have just ordered it. 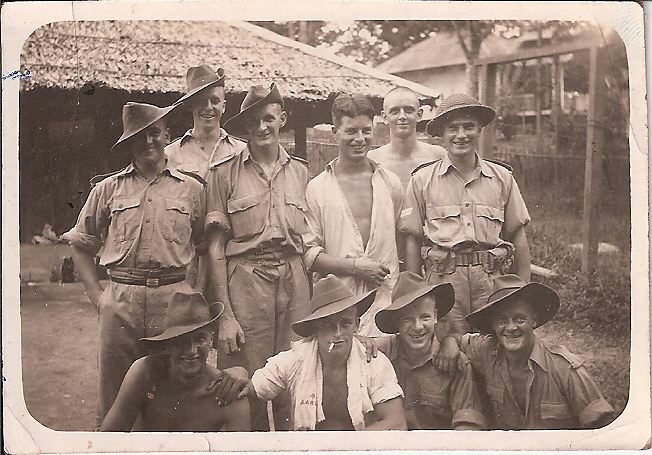 If your dad was a Far East POW I can understand his reluctance, very few could talk about it and most of those who did, only spoke later in life. Sadly, though my father recovered well, many of them came back too damaged to lead a normal family life, so they in turn made life hard for their wives and children. As my dad said, “War is no good.” Anyone today who did not participate in that war cannot possible imagine the trauma to the body and mind from being a POW of the Axis powers. As they weren’t able to feed their own soldiers towards the end, it is frightening to imagine what they were fed – or found to eat. I agree with your dad, not only is it no good, but it is only a temporarily convincing argument. The people who win are rarely loved (and usually only by a minority) and whatever the original problem, it just comes round again. Talking has to be better, but humans don’t seem to be grown-up enough to use it yet. By the way, I was just contacted by a historian from Oxford wanting to write my grandpa’s story of escape during WWII. WE need to keep these stories alive! Absolutely. These men (and women) were extraordinarily self-less and we owe them our existence and should remember them. I look forward to hearing more about your grandpa. I wanted to reblog this post, but there is no reblog place to click on to. I think that’s because it is a page not a post. I imagine I could email it to you, or make it into a post, what do you think. It would certainly reach more of the right people on your blog than mine… I’ve just seen your blog of one of the POW posts. Thank you so much. I am busy publishing my novel at the moment, but this is to get it out of the way, so that I can concentrate on the POW story. Thanks anyway, but I reblogged the main story. So few know about the CBI Theater and perhaps this will reach someone with information you can use in your book or in locating Line 27. Please accept my (belated) condolences on the passing of your father. I was privileged to know him during the late 70’s and early 80’s; I was a young lad who had just lost his father and was introduced to your father by a mutual friend. Major Baker (as I always knew him) introduced me to what has become a lifelong hobby, shooting, and moreover made a lasting impression that truly has shaped and influenced me throughout my life. I was last in contact with him just before I joined the RAF in 1987, his encouragement and mentoring helped me follow a path which I never would have without his influence. I am sad to know that he is no longer with us however will never forget what he did for me. It is very good to hear from someone who knew him and I’m especially glad to hear of the positive influence he had on you. He was a wonderful father, encouraging our ambitions and introducing us to wonderful hobbies. It makes me very happy to hear from you. I will make sure my brothers see your comments. My younger brother and his wife live at the same house and would, I’m sure, welcome you, should you wish to revisit old haunts. I was privileged to know Major Baker during the late 70’s and early 80’s. I was introduced to him by a mutual friend and he taught me the delights of shooting, a hobby I still pursue today. I spent many happy Saturdays doing jobs around his house and gardens in exchange for lessons in all matters shooting; his influence and mentoring has left an impression which lasts to this day. I am sad to hear that he is no longer with us but am truly thankful to have known him and will never forget just how much he helped me. It is very fulfilling. I can see it lasting my lifetime, but I will have to publish the main story soon even though I have only found a handful of the families so far.